You know what your product should be able to do. So you already have an edge over many of your competitors. Put your passion for this category into your product. For example, if you were disappointed about the quality of camping mats you purchased in the past, you already know what to tell your supplier to improve upon. Choose products you can talk about, improve and be passionate about selling. Here’s a real-life example. A friend of mine was really into hiking and trail running but not satisfied with the products on the market. So, he started a outdoor gear company a few years back. Today he has a portfolio of twenty different products in the outdoor gear niche and is making six figures on Amazon every month. It wasn’t an easy journey but it was well worth it. Let’s imagine you have 17 years of experience selling electronics (like me). What was the first product I picked? It was an electronic item. Why? Because that’s where I had my experience. I believe you should not just have passion about your product, but also experience. If I sell a product online I want to be able to answer customers’ questions and inquiries. So when I started my own brand I improved an existing item based on my industry knowledge and felt confident answering questions as well as presenting my brand. What if you don’t have experience in an industry? Do you have a hobby? Or are you a parent? If you are a parent you’ll have lots of experience with your children and could perhaps start in that niche. You shouldn’t worry if you don’t have products you are passionate about or industry experience. Many people I know are in this scenario and there are still lots of success stories. Take out a notebook and list your interests, hobbies or responsibilities. Yes, actually write it down. Call me old-fashioned, but I still find writing to be the best medium for generating ideas. Subscribe to newsletters from companies that talk about or sell products related to your interests. Over time, gather a shortlist of at least ten product ideas in that niche. Research existing products, consumer demand and selling prices using Amazon, eBay, Jet.com, local shops, tools like Jungle Scout etc. Is there space for one more seller? If there is no demand, is it because the product is in its fledgling stages? See if you can improve the product, create a to-do list of improvements based on reviews, get feedback from friends and family etc. If there is no evidence of demand and you can’t improve the product, but still think it could sell, then follow your gut feeling. Move onto the next product in your list of ideas. The more you research and think about products, the more new ideas you will have. Keep writing down your ideas, updating your shortlist, and researching the products on it. Work on this regularly, and over time the right niche should emerge. You can look for hours on Amazon in the different categories and niches, if you already have a sketch of a product idea. If you have no idea at all, I suggest you start with the best seller lists. Many categories are saturated on Amazon already so I recommend that you look into emerging and trending markets. This could be drone-racing, augmented reality or any other industry that’s just getting started. Be careful however not to get carried away with a hyped-up niche that’s going to fade in a few months, like fidget spinners. One of my favorite sites to find interesting blogs and trend websites is Kadaza. It’s a collection of the best sites in many different categories. Click on any of the categories and you will find websites in that niche. For example, I found The Gadget Flow through Kadaza, and by subscribing to their newsletter I get weekly updates on trendy items that may not even be on Amazon yet. They have a lot of products that are currently on crowdfunding sites like Kickstarter. But you know what? If it’s only on Kickstarter now, it means it isn’t on Amazon yet. You can take the product idea and even improve on it. The point I want to get across is not to copy these companies, but to find ideas on blog sites and see how quick it is to buy from Alibaba or Global Sources. Add an accessory, change colors or do whatever you feel could improve the product. The best thing about subscribing to these sites is that you get ideas delivered for free to your email address. You may have heard of Jungle Scout already. Jungle Scout is a paid tool but it is probably the most advanced when it comes to researching Amazon and finding products with great potential. It also integrates into the Google Chrome browser to streamline research and has several other tools, including the “Niche Hunter”. Jungle Scout can extract sales rank, sales volume, FBA fees, categories and more. It is now available in almost all countries where Amazon is present. Jungle Scout has helped me many times to validate a product that I wanted to sell. Personally I love the Chrome extension that you can use to scan the Amazon category pages. You get a lot of data including sales per month, potential profit and much more. My favorite has to be the “Opportunity Score” which can quickly tell you whether a product might be worth pursuing. It ranges from one to ten and while anything below seven isn’t considered great, with some product development work you can still have an opportunity. Even though Amazon is heavily saturated I can still find gems with scores of seven or higher. Just the other day I found a product for one of my clients with a score of nine (which is extremely rare). There are hundreds of trade shows each year in many countries. You get to meet the supplier, see the products, and talk over details such as prices, models, and much more. On top of all of that I guarantee you that you will get inspired with new product niche ideas. To find local trade shows just Google an exhibition center near you, then browse their upcoming events and register for a ticket. You might need to provide a business card and contact details, but you can order cards online for a few dollars these days. Going to a show prepared, and with a professional image, gives suppliers a great first impression of you. Another way to find new products is simply when you are out in a shopping mall or a local store. To start your own import business means that you also working when you are out shopping with friends or family! Keep your eyes open, and when you see something cool make a reminder for yourself on your smartphone to look the product up later. Traveling is also a great way to find ideas. When you are out of your country or state you are likely to see items that you can’t find locally. There are many reasons why a product might not be available where you live, so it’s always worth checking an idea out. I remember about ten years ago, a friend told me about Bubble Tea and Fancy Green Tea drinks sold in Hong Kong and Asia. She was from Germany and she had never seen these drinks back home. She didn’t pursue that idea but a few years later these drinks started to pop up in Germany and were a smash hit! Even an idea that at first seems like nothing could be worth millions. Discuss it with a few friends and brainstorm what you could do with it. Product sourcing sites like Alibaba and Global Sources are very popular for finding manufacturers, but they can also be used to inform you about new and trending product niches. When you sign up on Alibaba you generally need to say which product categories you are interested in. This is important, because based on this criteria (and your recent product searches) you’ll get automated emails with new product deals. You can also simply type “newest products” in the search box on Alibaba and you’ll find a lot of the newest and trendiest items from their suppliers. It’s pretty similar with Global Sources. After signing up you’ll get automated emails with great product deals. They also have a section called Analyst’s Choice with a selection of innovative products in every product category. But my favorite part of Global Sources is their Sourcing Magazines that are updated on a monthly basis with the hottest and newest products on the site. It doesn’t get easier than this and I’ve found some gems in their magazines sometimes. Sometimes you can find a niche by starting with a design trend first, then looking for what product niche it could be applied to. To find design trends, it can be as simple as searching Google for “design and interior trends” including the year. Visit a few sites and see what trends are hot right now. Current trends could be as simple as a color, such as “millennial pink”, or a more general theme like “vintage”. Look for products which you could apply that color or design theme to. What also helps is Google Trends and Google Keyword Planner (free if you have a Gmail account). With Google Keyword Planner, type in a keyword and look for the number of monthly searches. A search volume greater than 1,000-10,000 is a good indication. 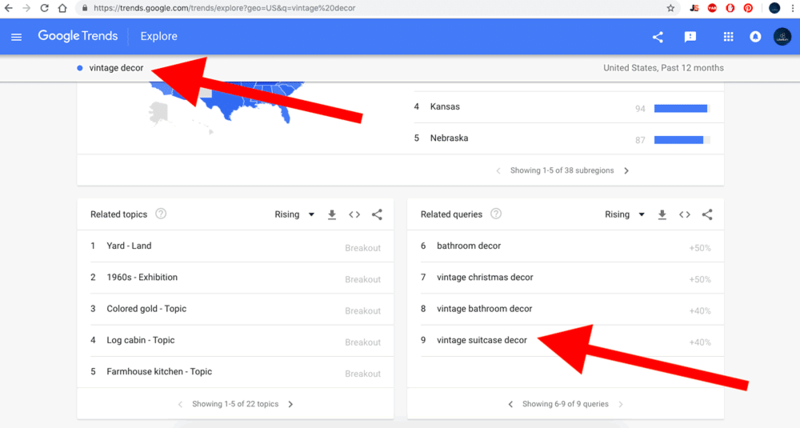 I could now look into vintage bathroom decor or vintage suitcase decor on Amazon, using Jungle Scout to provide extra data like sales estimates, and see if I can find a niche with good potential. The first nine methods here can still work, but a more advanced approach that can be really successful is to develop your own product from scratch. 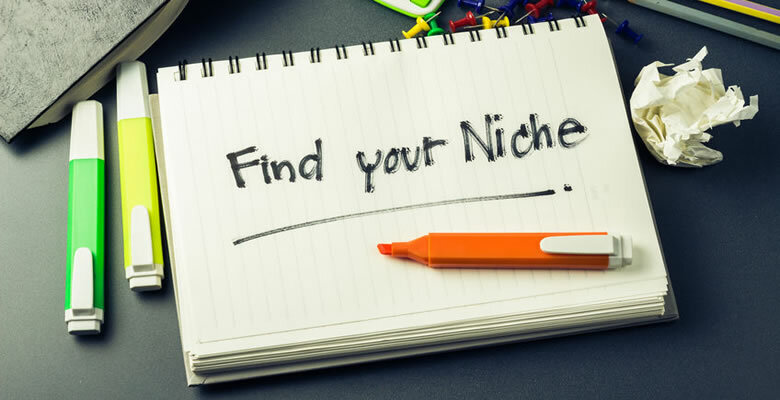 Focus on one niche. Don’t try to sell a wide range of unconnected products. Find an existing, mature market with ready customers to give you feedback. Concentrate on what research says the market needs and not what YOU think the market needs. Make sure you can actually access this market. It shouldn’t be dominated by huge brands, for example. Get out of your comfort zone and consider products that are higher-priced, bulky or difficult to ship. But also stay realistic, and avoid products that require a lot of investment or are beyond your technical know-how. Amazon is getting more competitive all the time and sellers who can only make me-too products, or slight improvements to existing products, will eventually fall behind the market. To create simple products at first is totally OK but if you want to make this a real business that will be around for years to come, I suggest you learn how to develop your own products. This post was by Manuel Becvar, Founder & CEO of sourcing education site Import Dojo. With the new Find Me a Product! service, Manuel personally finds products for clients to sell on Amazon. The service includes eight to ten hours of product research plus one hour of coaching. The service is limited to 15 slots per month and sells out quickly, but there is a waitlist so sellers can get notified as soon as new slots are added. Thank you for sharing information about UPC. Confirmed with Amazon today that they have a lot of problems with cheap UPC codes. Kadaza- this is new to me. Thank you again ,Manuel. Thanks for the valuable information. So how about using terapeak for researching for products (instead of junglescout for example)? would you advise to use it? Even though terapeak is more focused on ebay but in the end it’s also focused towards the USA market just like junglescout so most probably the trending products on ebay would also be trending/wanted on Amazon. Yes, I have used Terapeak before and it’s also good for Amazon. They’ve added a couple of things among them finding bestsellers on Amazon linked with Alibaba suppliers. But yes, they are heavily focused on eBay. Good article dear Manuel. As always! Excellent article! I’ve just begun with affiliate marketing, but would love to move into private label. You’ve provided a great road map and ideas, so hopefully I will get there soon! Hello! I am thinking to sell on Amazon. Actually I want to do it now. I need to to know couple of things. How much minimum money do I need to have to start selling on Amazon? When it comes to selling on Amazon. Shall I go for. I could not find products with white label on google search. I am l looking for light items that cost me less postage such as wireless earphones. I am just starting out. So I nee your help in this.